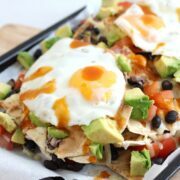 In keeping with the Mexican-inspired breakfast theme (see last year’s breakfast tostadas), I bring you: breakfast nachos! Because obviously, as long as you slap an egg on top of something, you can totally justify eating it for breakfast. In reality, this is more of a brunch dish. 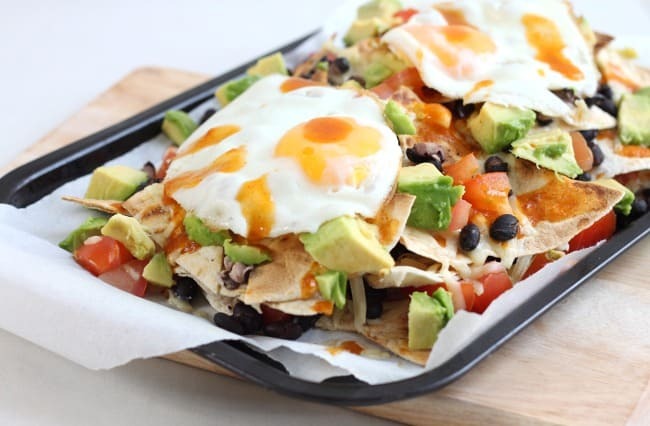 I can’t really see anyone getting up before work and making a plate of nachos for breakfast, but on a lazy Saturday morning when you sleep in til ten, this is the perfect thing to get up for. So, really, less ‘brunch’ and more ‘whoops I overslept, better have a late breakfast and then not have to bother with lunch’. I made my own tortilla chips for these nachos (nowhere near as impressive as it sounds – literally just cut up some tortillas and grill them for a few minutes), but you could use shop-bought tortilla chips if you’re in a hurry. I do think that the ‘homemade’ ones take these nachos to the next level, though! Once you’ve got your tortilla chips, all you need to do is layer them up with black beans, grated cheese, fresh tomatoes and a generous dash of hot sauce (this one‘s my favourite!). Then once they’re cooked, add a fried egg, some diced avocado, and another dash of hot sauce for good measure, and you’re good to go. Easy peasy. In an attempt to make this recipe quick enough to justify calling it a breakfast dish (because who wants to spend 45 minutes on breakfast? ), I grilled my nachos rather than baking them like I usually do. It still works fine, but if you’re not pushed for time, I do think that baking is better because it gets all the cheese in the lower layers nice and melty. Cut the mini tortillas into triangles (I cut each into 8), and lay them out on a baking tray. Keep them in a single layer if you can, but it's okay if they overlap a bit. Spray them lightly with oil, and add a pinch of salt and pepper. Place under a medium grill (broiler) for a couple of minutes, until golden brown. Then, flip each tortilla chip over and repeat with the other side. When the tortilla chips are ready, layer them up (on a baking tray covered in baking paper) with the cheese, tomato, black beans and hot sauce - I ended up with three layers of each. Place back under the grill (don't have the temperature up too high - you want to try to melt the cheese all the way through, rather than just brown the top). While the nachos are grilling, fry your eggs to your preference - I did mine sunny side up. Also dice your avocado. 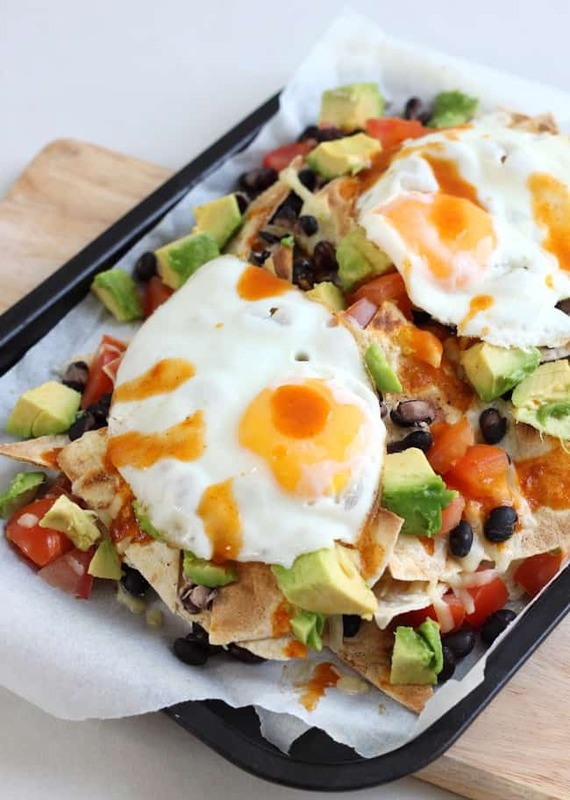 When the nachos are hot and crispy, top them with the fried eggs and diced avocado. Serve immediately. Still got more eggs to use up? 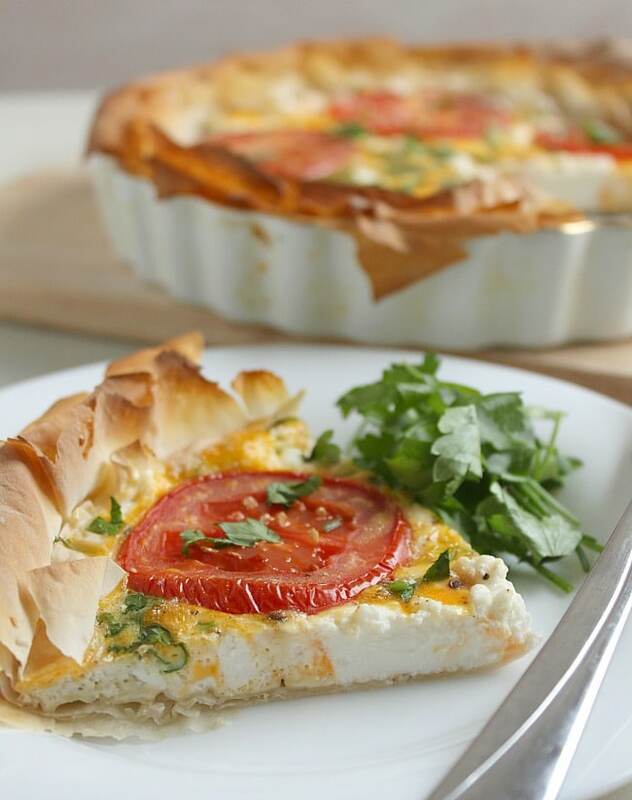 Make my ricotta and tomato tart! Mouth watering! 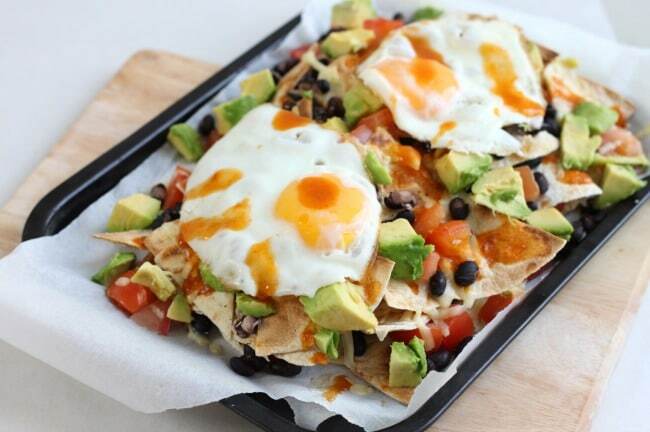 Breakfast nachos have caught my interest. I will ask my sis to prepare it for me. She will be happy, too. 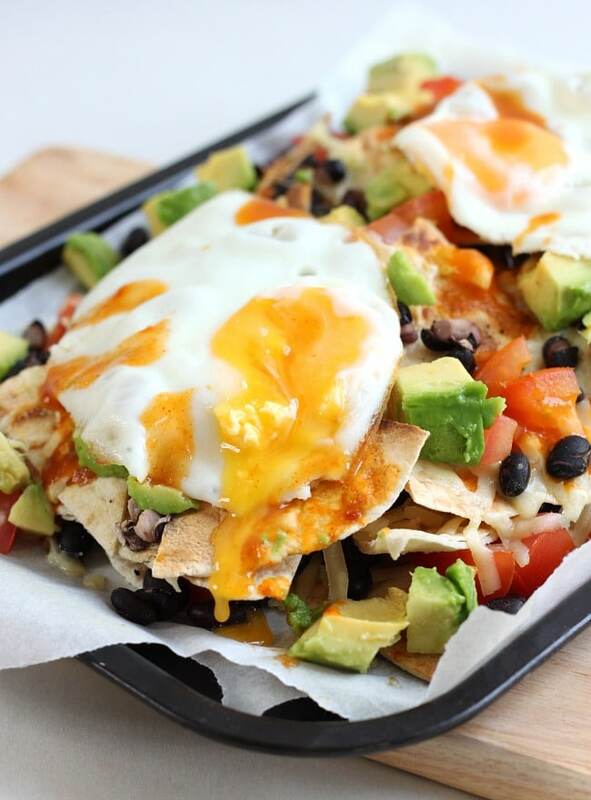 Ummm….. you had me at breakfast nachos…. yes. this is totally justifiable for lunch breakfast and dinner! Oh my godddd, I want a giant plate of these right now! 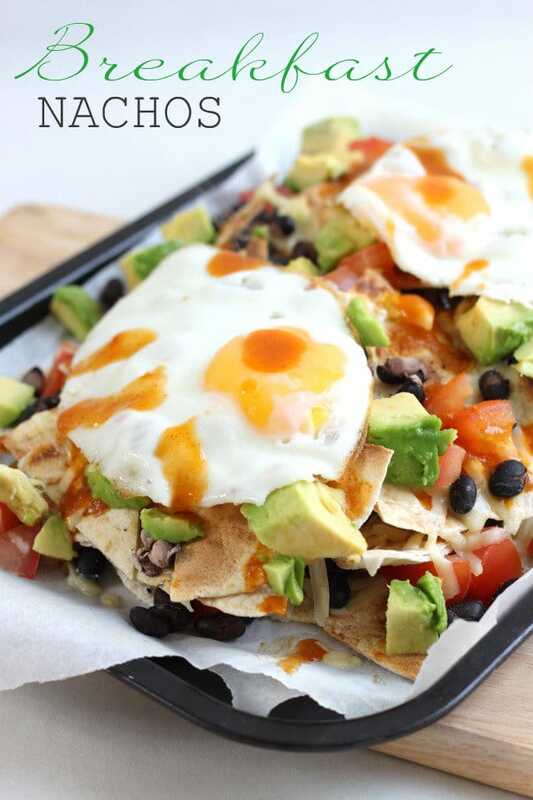 Breakfast nachos are my go-to “one too many glasses of wine the night before” breakfast!! Love the look of these, I’ll have to remember them for the next time that happens! What a dish! I’d gladly eat this for breakfast, lunch, or dinner! Yum! These look so good! And I agree that as long as you plop an egg on top, you can absolutely call it breakfast. I never would have though to make nachos for breakfast or brunch, I’m going to have to give these a shot over the weekend. Pinning!